The Echo Look camera is the $200 virtual fashion assistant from the minds of Amazon. Cataloging a wardrobe and getting a second opinion is nice, but this innovative device deserves more depth. Have you ever had a big night out and couldn’t decide what to wear? You throw on different outfits and stand in front of the mirror pondering. Does this dress accentuate my figure? Does the shirt match the jacket? If that’s you, Amazon might have you covered. The Amazon Echo Look is the newest and most unique Echo device to hit the market. The $200 camera aims to be a virtual fashion assistant for your home. By using the hands-free camera to take and catalog photos of your wardrobe, Amazon will utilize an advanced algorithm to help you up your fashion game. It’s using AI to answer the age old question “does this outfit make me look fat?”. At 2.4 inches in width and 6.3 inches in height, the Echo Look is inconspicuous enough to sit on a dresser without drawing much attention. And while it may look like your standard indoor camera, it’s actually got some impressive technology behind it. The 5 megapixel photos aren’t earth-shattering in quality, but just enough to provide a great photo from a few feet away (this will be covered more later). The camera inside utilizes the Intel RealSense SR300 for sensing depth. This is important in not only picking you out from the background, but to determine how the outfit fits on your particular frame. From a set up standpoint, The Echo Look is as easy as other Amazon products. The camera screws into a swivel base that allows you to manually adjust to the angle you prefer. There is also tools inside if you prefer to attach to a wall. Unfortunately there is no battery option available which could be a bonus for those looking to take the device with them to a store’s dressing room. Besides it’s use as a camera, the Look can act as another Echo device in your home. You can have it control other smart devices (lights, switches, etc), play music, or any of the other uses you’ve found for Alexa. 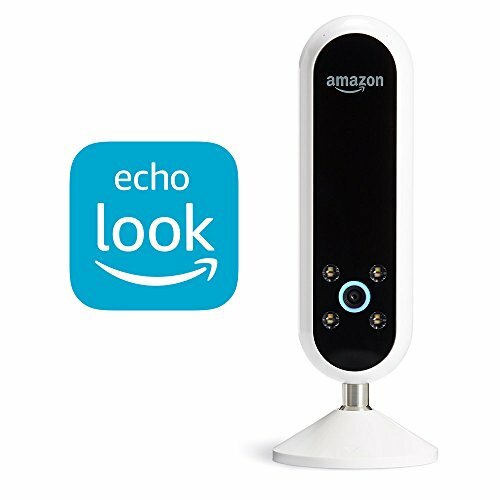 Unfortunately the Echo Look can’t be used for security like the Amazon Cloud Cam for some reason. It’s sole purpose as a camera is for taking photos on command. There are some flaws when using it as an additional point of contact in your home for Alexa. The first is that it doesn’t communicate well with other Echo devices. When giving an Alexa command, Amazon’s Echo Spatial Perception will have the closest unit respond. But for some reason the Echo Look doesn’t work that way. So if you have the Echo Look in a bedroom that also has the Echo Spot alarm clock, it’ll trigger both devices at the same time. This could force you into turning off the Echo Look when it’s not in use. The other issue is the sound. Now I wasn’t expecting a powerful audio experience, but I was disappointed in how weak the 1.6 watt speaker in back was. Alexa’s voice is fine, but it’s hard to enjoy any kind of music out of it. There is no Bluetooth available to connect an external speaker either. For comparison, the sound quality is considerably worse than the Echo Dot. Despite some of it’s limitations, the Echo Look at it’s core is built for fashion. It’s a convenient way to catalog your wardrobe. You’ll first need the Echo Look app on your smartphone. With a few clicks you should be connected to the camera and ready to work it. From there, just say “Alexa, take a photo” and it will oblige. You can also ask the Echo Look to take a video which gives you 6 seconds to strike a pose or spin around to give a better look at what you’re wearing. Photos and videos are immediately uploaded to your Amazon account so that you can view them on your phone through the app. They are cataloged by date, season, weather, or whatever custom setting you want in the app. I personally cataloged outfits by work and casual. You can even add additional notes to each outfit for future reference. All the photos and videos can be downloaded off the app and shared with friends. For those who see this as a hands-free selfie machine, you’d be underselling it. The photos were terrific and it’s ability to blur out the background (this can be turned off) really makes everything pop. Four LED lights surround the lens and help provide the perfect lighting for the room. Something many of us have struggled with when using our phone to take photos in front of a mirror. This was by far the most impressive aspect of the Echo Look camera. One of the primary selling points of the Echo Look was the virtual fashion assistant that came with it. A service where you could compare outfits and be told which one looks best on you. This is supposedly done by a mix of computer AI and real-life style experts. With about 40 photos of both myself and wife in tow, I began testing out Style Check. The results of testing weren’t surprising. Style Check tended to focus a lot on how an outfit fit. Snug shirts would get a “fit looks better” note over baggier options. It gave notes about which outfits clashed and which colors worked best. It even noticed when I wore a pair of dirty sneakers with a suit. Overall I agreed with most of the choices Style Check made and despite it being a bit vague in it’s reasons, it was a fun gimmick. But despite my enjoyment, I felt it lacked depth to be a true style assistant. While it could tell me which shirt and tie look better on me, it can’t tell me which one would be more appropriate for a funeral. It couldn’t tell my wife which dress is appropriate for a night on the town as opposed to a business meeting. The situation is something their AI is not taking into account right now. It also didn’t want to give me a lot of feedback. This might be to protect it’s algorithm from being reverse engineered, but it also left me in the dark. Was it basing decisions on the weather in the area? On my age? Was it taking into account current fashion trends? I don’t know if it was making the same decisions for me as it would an 18 year old. More detailed feedback or options for what I’m trying to accomplish (look professional or look trendy for example) would be a welcome addition. Beyond the Style Check is Amazon’s own recommendation feature. This sends you directly to Amazon.com and tries to pair you up with clothing it’s algorithm determined would be good for you. This feature wasn’t too intrusive but it also wasn’t particularly useful. It seems heavily influenced by colors I wore and focused more on replacement items instead of accessories to outfits I currently own. Perhaps it needs more time to “learn” about me, but for now I don’t see many people using it. This is an ambitious idea from Amazon and has a ton of potential. Cataloging a wardrobe like Cher in Clueless has been a dream for many. And for that, the Amazon Echo Look does a solid job. You’ll get high quality photos that can be organized in any way you want on your phone. But beyond that, there are just too many negatives to overlook. While Style Check is a nice tool for getting a second opinion, it’s not transparent enough that I’d feel comfortable trusting it on a daily basis. That fact it clashes with other Echo devices and has a terrible speaker don’t help either. But perhaps it’s biggest problem is the $200 price tag which feels about $100 too high for a device Amazon is using to mine more data and sell clothing with. If you’re heavy into fashion and already have a hearty budget dedicated to it, I think the Echo Look can fit right in. But for the average person looking for a little help, save the money and ask a stylish friend instead.